The Bremco Large Goods Cage Crane Lift is ideal for the air conditioning industry and for construction companies wanting to lift products safely onto high rise buildings. 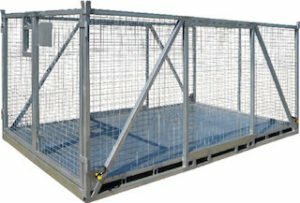 The cage has been designed to enable the lifting of large and awkward products with the use of four-point lifting eyes. 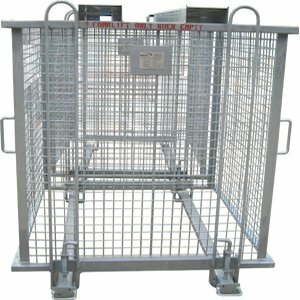 Our large goods cage comes with four crane-lift points standard with bow shackles fitted, is fully Australian made in our local factory, and we offer a 100% money back guarantee on our work. It meets Australian Safety Standard AS4991, and all units are tested, tagged and compliance plate and serial number is attached. 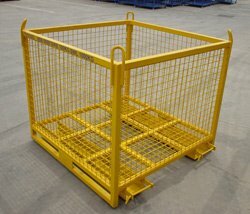 We can also custom fabricate a crane goods cage for your specific requirements. Read more about how we can work with you to develop the ideal custom steel fabrication solution for your warehouse. 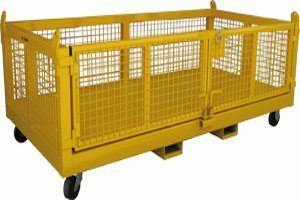 Please note: the Large Goods Cage Crane Lift is not to be used for lifting staff or personnel under any circumstances. Contact our friendly team today for a quote or to place an order.